WAIST HIGH: Happy 25th Birthday Talk Talk. Happy 25th Birthday Talk Talk. Known simply as Talk Talk in the U.S., the band's debut album was their most electronic of all. The first track, "Talk Talk," was the first single to get air play in America before "It's My Life" hit the top 40 a few years later. Talk Talk, comprising singer Mark Hollis, bassist Paul Webb, and drummer Lee Harris, formed in England in 1981. From the start, Hollis cited jazz and classical artists like Miles Davis, John Coltrane, and Claude Debussy as major musical influences. 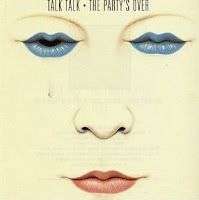 While they never completely embraced the fading New Romantic trend, Talk Talk's name drew unenviable Duran Duran parallels, which were cemented by the hiring of Colin Thurston to produce The Party's Over, as he had done with Simon Le Bon's band. The LP went on to sell over a quarter of a million copies, although an extensive American tour supporting Elvis Costello produced only modest results. Tellingly, this would be the first and last of their albums on which writing credits were shared by the entire band.